FORUM-ASIA welcomes the Secretary-General’s report on cooperation with the United Nations, its representatives and mechanisms in the field of human rights. We share his concerns on allegations of intimidation against human rights defenders who seek to cooperate with the UN and appreciate his efforts to draw attention to specific cases of reprisals, as well as follow-up on cases presented in his previous reports. We echo the Secretary-General’s recommendation to states to prevent intimidation and reprisal, raise awareness on such issues, and ensure accountability in cases that may occur. We welcome his future efforts to address policies and practices that may hamper access to the UN, and hope human rights defenders and CSOs would be a critical part of this process to tackle current challenges. We are deeply concerned by the increasing use of social media by state and non-state actors as a tool for intimidation or reprisal against human rights defenders who have cooperated with the UN. FORUM-ASIA draws the Council’s attention to cases of Asian human rights defenders who have cooperated or attempted to cooperate with the UN. In June 2015, the Human Rights Commission of the Maldives was barred by the Supreme Court from communicating with foreign organisations without government oversight. This followed the Human Rights Commission’s submission for the Maldives’ UPR, which was declared unlawful by the Supreme Court for having criticised the Supreme Court and its influence over the judicial system. On 03 April this year, the Prime Minister of Nepal summoned and questioned National Human Rights Commission commissioner Mohna Ansari on her statement during Nepal’s UPR in March, which called on the government to investigate allegations of excessive use of force by security forces in the Tarai region. On 14 September, Indian authorities prevented Kashmiri activist Khurram Pervez from leaving the Delhi airport and participating in this very session of the Council despite the fact that he held a valid visa. The following day, he was arbitrarily arrested at his home. He now remains in preventive detention without clear explanation. 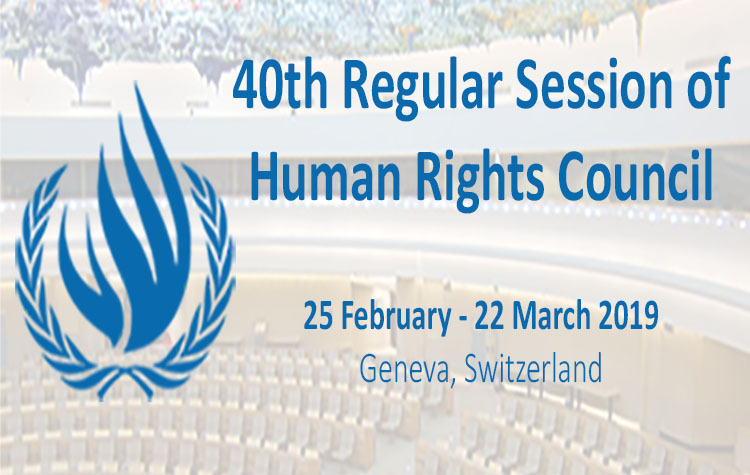 We call on states to ensure that human rights defenders cooperating with the UN and other international human rights mechanisms are protected against all forms of intimidation and reprisals by state and non-state actors. We call on the Human Rights Council to address cases of intimidation and reprisals that come to its attention.